The endless black abyss of artist Anish Kapoor's Descent Into Limbo -- a cartoonish 8-foot-deep hole invoking the booby traps popularized by the Looney Tunes -- has claimed its first victim. 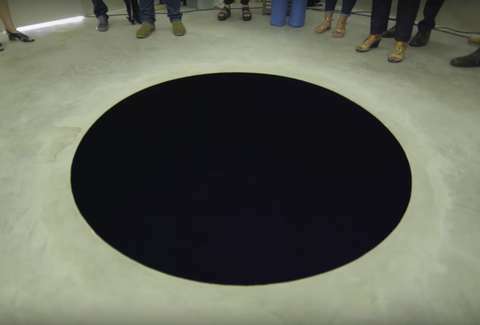 Currently on display at the Serralves Foundation in Porto, Portugal, the exhibit is described as a "cubed building with a dark hole in the floor," meant to induce void-like feelings and perhaps a bit of vertigo. But that doesn't tell the hole's story. The extra dark pigment might give the impression of a cosmic passageway, but the laws of gravity still apply to Descent Into Limbo. One museum-goer who tripped down the 8-foot chasm experienced this first-hand. According to England's Times, a 60-year-old Italian man experienced a descent into hospital when he stepped on the black hole, tumbling down to the surface beneath. Since Kapour's use of an extra-dark pigment renders the hole depthless, the man trusted the contour-less surface as if it were a part of the floor. His trust was for nought, though, as his ill-advised step resulted in a painful accident, even in the presence of warning signs and museum employees advising him and others to STAY AWAY FROM THE HOLE. Shortly after the incident, a spokesperson from the museum told the Art Newspaper the “visitor is OK [and] almost ready to return home.” The museum closed the exhibit in an effort to investigate what happened, but that was to only last "a few days" at the most, per the spokesperson. Descent Into Limbo first burst onto the art scene in 1992, looking like the bane of Wile E. Coyote. It predates Kapoor's 2016 acquisition of sole artistic ownership rights to Vantablack, the darkest pigment in the world. Developed by Surrey Nanosystems, Vantablack absorbs 99.965% of reflected light, making it "the darkest man-made substance" on Earth, or, you know, foil for Bugs Bunny. Getting duped by the exhibit might be embarrassing, but it's still nowhere near the red-faced shame of destroying an entire display room because you took a selfie.